Chicken Piccata is a classic Italian dish that makes cooking chicken nearly foolproof because the chicken is so thinly sliced. Piccata is actually a method of preparing food and not a description of the sauce itself. 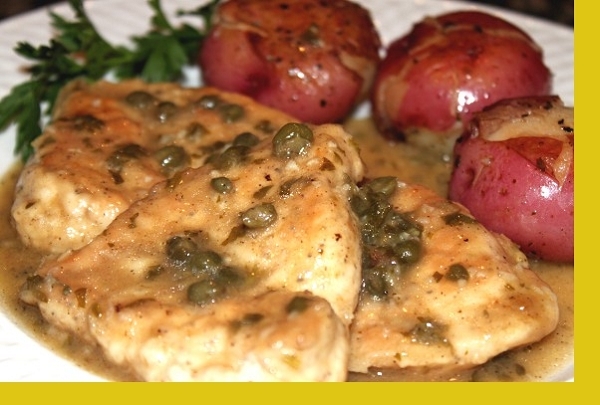 Piccata is meat that is sliced, coated, sauteed and served in a sauce. Our chicken piccata has a rich lemon-caper sauce that's made with extra-virgin olive oil and just a touch of butter for flavor. Served with potatoes or mashed potatoes. 1. Place each chicken into the flour mixture, cover thoroughly, then remove and set aside. 2. Heat 3 tablespoons of oil or butter in a large skillet over medium heat. When oil starts to sizzle, cook chicken 2 minutes per side until golden brown. 3. Remove chicken from skillet. Add sauce to pan and bring to boil. 4. Add chicken to skillet and simmer for 5 minutes. Loved this dish especially the sauce. Next time, maybe angel hair pasta? We loved this dish. The sauce was the highlight and little more of it would be great. Wow! This meal is delicious! We thought we were at a five star restaurant! We will definitely order again. I did not care for this dish. That said, it was simple to prepare and we all ate it. My kids thought the sauce was a bit "slimy" in texture. This is definitely one of my favorites. I will order it again when it's available. I learned a cool thing about chicken breast sliced thin this way which was that it cooked really fast and was really tender. I loved the sauce with the capers! The potatoes were sliced into chunks and the dressing for them was really nice. This dish was very good and easy to prepare. It was one of the bestwe tried. The directions were extremely easy to follow and best of all - the dinner was exceptionally good! This was my first time to try the Chicken Piccata & the chicken was moist & tender cooked following the directions included. I would have liked more capers & maybe a small amount of angel hair pasta. I would have preferred a green vegetable instead of the potatoes. The ease of the preparation of a delicious meal without my having to prepare the chicken & sauce was such an indulgence I shall experience again. This meal was simple to prepare and tasted delicious. This was SPOT ON. The sauce is so flavorful and yummy - I couldn't stop eating it!! We had some leftovers and it was even better the next day! The potatoes were really easy to make and super good too. Perfect. Love the chicken and potatoes but the portion size of potatoes for two was way too small!!! This meal was simple to prepare and tasted fantastic. My daughter gobbled up the potatoes and proclaimed them as "the best potatoes ever!" which is quite a compliment coming from a little one who craves fast food fries. This was hands down the best chicken picatta I've ever had. The sauce was amazing and the potatoes were so simple but beautifully seasoned. It was so simple to make especially after a long day of work. I will definitely order this again. I have had this dish twice and the sauce is amazing. 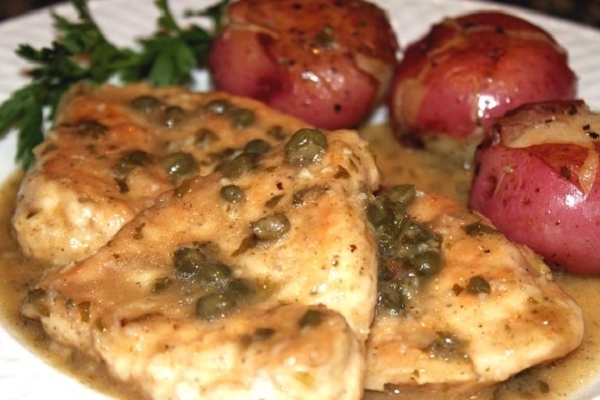 The capers add a nice flavor. I will definitely order this again! Love all your chicken dishes so far! The chicken piccata was excellent and the potatoes were to die for! The food preparation instructions were easy to follow as well! My daughter loved the potatoes. My husband & I ate for lunch & I ate the left over for dinner. The chicken sauce was tasty! This was very good. The sauce for both the potatoes and the chicken were amazing. I did the chicken in the oven after the potatoes had cooked a while and then added the sauces. Very yummy.